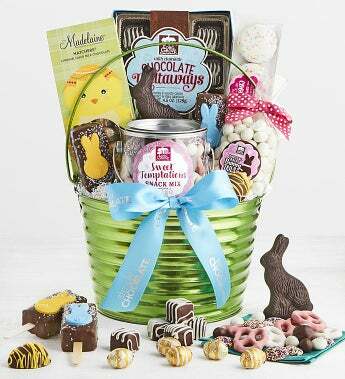 This Simply Chocolate exclusive Easter basket holds a delightful assortment of the best of Long Grove Confectionery and Madelaine Chocolate. It arrives brimming with over two pounds of premium Easter chocolates. The artisans at Long Grove have created adorable crispy chocolate bunny pops, a milk chocolate peanut butter egg, milk chocolate melts with white drizzle, white peppermint bunny tails pretzel balls, Spring Temptations Candy Snack Mix in a pail, and confetti cookies! Madelaine's renowned chocolatiers will make their day with their amazing milk chocolate caramel foil eggs and dark chocolate bunny. This amazing gift arrives in a shimmery green embossed metal pail tied with a Simply Chocolate signature satin ribbon and all treats are individually wrapped. Founded in a quaint, picturesque Illinois village in 1975, family-owned Long Grove Confectionery has stayed true to its heritage of using the freshest and best quality ingredients in their artisan-inspired chocolates & confections. Madelaine Chocolates has been bringing delight to families all across America with their famous molded chocolates for over 70 years. Their iconic Easter Bunnies and Foil Eggs are essential to every Easter basket. They have been "sharing every chocolate moment, since 1949". Total Net Wt. 2 lbs. 1.52 oz.